Monument Valley is not a National Park. It’s a Navajo Tribal Park with a stunning desert like landscape in Arizona and an excellent year-round destination. Seasons with pleasant weather and without a lot of traffic on the scenic drive are early spring (late March/April) and late autumn (October). Cooler but very quiet months are the winter months from November until March. Read on for more season details (spring -summer - fall - winter), the best ‘WHEN TO GO’ tips and our detailed hotel and camping guide. Despite the possibility for extreme weather conditions with some very hot days in the summer and a few colder times in the winter, most days of the year are quite suitable for an enjoyable visit. Due to the higher elevation of 5200 feet it’s a little cooler in general. The Wind is a major force in the valley. Even in the warmer months of spring and fall, bring an extra layer of cloth as it can get chilly in the mornings or late evenings. Light rain gear is also a good idea. The average maximum daytime temperature in April is a pleasant 19°C (66°F). In May it gets warmer with an average maximum of 25°C (77°F). That means both months are perfect for a visit. Most April visitors report, that it’s still quiet most of the time. In May it gets busier but still not heavily crowded. Keep in mind that particularly from April into June it’s often more windy than usual and it can become horrible dusty due to heavy winds. Clear, warm, sunny days and cool nights make this a delightful season to visit. July and August bring the warmest conditions, with temperatures in the 90s (over 33 °C) but rarely exceed 100 °F. The Visitor Center, as well as the scenic drive, become very busy during these summer months. Always check the weather forecast for occasional summer thunderstorms, especially from July to mid-September. Still warm in September and pleasant temperatures in October. Autumn provides some of the most stable weather of the year. Keep in mind that in September even after labor day the scenic drive and the Visitor Center are often still busy. In October the crowds get smaller and there is less traffic on the road. Mild cold weather conditions start around mid-November. Snow conditions start later around mid-December and can last until February/early-March. Even in the winter, temperatures below 0 °F (−18 °C) are rare. But still, a warm coat is highly recommended. The valley only receives an occasional light snowfall and sometimes snowstorms in the winter. However, the snow melts usually within a day or two. Most visitors report that it's no problem to drive with almost any kind of car in the colder months. Winter is the perfect time for solitude without the crowds and low prices. Lucky visitors can see the valley and rock formations dusted in snow. Later in early spring, March is a great month without the holiday crowds and temperatures get more pleasant as they can rise up to 60°F (15°C), nights and mornings are still cool and chilly though. Crowds in Monument Valley means a busy road while driving the scenic loop, many tourists at the Visitor Center and a fully booked View Hotel. The busiest months are from May to September with a peak in the summer months: late June, July and August. (The ‘official peak-season’ with different opening times is from April through September) If you plan to stay at ‘The View Hotel’ in high season, book well in advance. Also, keep in mind that the hotel rates are at their highest. Sometimes there are even busy days / weekends on the road in April or October. However, most visitors experience a rather quiet drive in early spring or late autumn and real solitude in the winter. During busier months the traffic starts to pick up around 10 AM. That means you can’t just pull over and take pictures at will because of the traffic and dust. In peak season the major viewpoints are crowded resulting in big traffic jams. Avoid those busy times by starting early in the morning with less traffic and less dust. Even in early spring and late fall, you’ll benefit by heading out at breakfast time. Avoid weekends and try to go on a weekday. Another option is to visit in the cooler months or even in the winter: It’s colder, but especially in December, January and February you’ll experience peace and solace. November (up to 12°C / 54°F) as well as March (up to 14°C / 57°F) bring more pleasant temperatures but it’s still much quieter than during busier months. We listed the best places to stay in the main text below (scroll down). However, when we went there we always stayed at Goulding's Lodge and had a great time. Always! Booking link is in the text below. Also read the reviews on TripAdvisor (don't just look at the star rating! ): Goulding's Lodge & Campground - TripAdvisor. For deals check the list below. Tip: Press 'See all deals' and bookmark the results in case you're not booking right now. Monument Valley is one of the truly iconic places in North America. The unique sandstone formations are recognizable the world over. The valley has been the backdrop for popular western movies with John Wayne as well as the location for films like Back to the Future 3 or Forrest Gump. Is it a National Park? No, Monument Valley is located in a Navajo Tribal Park and you can’t use your National Park Pass as they are not valid here. A tribal park is a Navajo Nation equivalent to a national park. First you’ll arrive at the Visitor Center, which already offers stunning views of the valley. From the parking lot you’ll see the West and East mittens. Quite a few visitors report, that the sight of these awe-inspiring monoliths brought tears to their eyes right after they arrived. The center contains a crafts shop and exhibits devoted to ancient and modern Native American history. Many guided tours as well as the self guided scenic drive or hike starts here. Right next to the center is the View Hotel. There are two close alternatives for accommodation. One directly in the park or very close to it: The View Hotel and Goulding’s Lodge. Other options are slightly further away. The View Hotel (inside the park): This is the only hotel located within the park. It’s right beside the Visitor Center. Every room offers the same amazing view. The top floor rooms are more expensive but there is no advantage in terms of a ‘better view’. Hotel website: The View Hotel. Depending on the season rooms average from $100 to $ 300. Book well in advance if you plan a visit in peak season. (Youtube Video: The View Hotel) They also offer 29 cabins for those who want a little more in terms of privacy combined with luxury. Check the Monument Valley Cabin Website with direct booking options. Rates for a cabin start at $ 220 in low season. 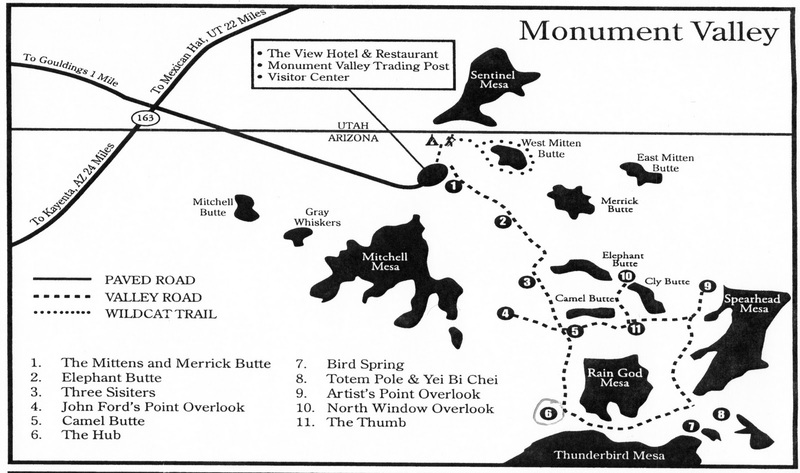 Hotel Alternatives (17 - 35 miles): Other accommodation alternatives include the Hat Rock Inn (17 miles) or severals hotels in Kayenta (20 miles). Check this list: Hotels near Monument Valley. However, a truly unique and highly recommended alternative is the Valley of the Gods Bed and Breakfast . You drive 35 miles (40-45 minutes) on Highway 163, but it’s totally worth it. Read the reviews. Monument Valley is in a remote part of the country and there are no major nearby airports. Some regional airports exist, but they are usually more expensive, with longer flights or more stops than major airports. The nearest bigger airports are the Phoenix Sky Harbor International Airport (Phoenix) about 300 miles and the Albuquerque International Sunport (Albuquerque, New Mexico) about 330 miles. The best way to get there is probably flying in via Las Vegas: The McCarran International Airport is located approximately 375 miles west in Las Vegas, Nevada. If you have 10-11 days you could do the Grand Circle Tour, starting from Las Vegas, with many amazing National Parks including Monument Valley Tribal Park. @Ray; this are marvellous pictures. Have you any contact details about the Navajo tour guide? How much does a tour guide cost? Hi Nick, I have used this tour company twice with good results. The cost varies depending what you want to do and how long you want to stay out. Good luck and have fun. A few more...I love this place. Looks great! Thanks for these awesome pics. @Ray: I just read an article about Canyon De Chelly National Monument. This must be close. Have you been there too? Hi Martin, I have not been there and its is fairly close by...its on my list though. Post some photos when you go. Very beautiful scenery with unique nature. Needs to come back again, just did a very brief visit last time. Une impression de liberté absolue ! We stayed in one of the little cabins....amazing! A "must see" location to visit. Simply spectacular scenery and a very spiritual feeling in the valley. I was there in September. Weather was pleasant. I was travelling with a group of photographers. We had the opportunity to camp overnight in the valley. Make camping arrangements with Navajo guides well in advance if you want to enjoy this experience. You can find more photos here. While the Mittens may be one of the most recognizable features of Monument Valley, there is another view that has a reputation of capturing many a creative's heart. Artist's Point is a well known overlook popular especially with painters. Its just over half way around the 17 mile unpaved driving loop and an excellent place for a picnic. The day I was there was a beautiful spring day, with sun shinning and puffy clouds. The wind was a bit kicked up so there was some dust in the air, rendering the picture not as detailed at distance. This gives the image such a great "painted" quality that I really like. What do you think? Starburst at the Totem Pole –– In the chill of an October Dawn. Navajo Tribal Park, Monument Valley, AZ.